Paying tax and in-time filing of tax returns is the responsibility of every citizen of any country. Any citizen who have certain level of annual income either from salary or business, he must have to register himself at FBR's online tax filing system, iris. There are many benefits of filing income tax returns in Pakistan but most of the people don’t know much detail about it. You name will appear in Active Taxpayers List (ATL) which can be verified online or via SMS. You will save in WHT taxes on your bank transactions (cash withdrawals and money transfers etc.) as compared to those who are non-filers. On cash withdrawal (Over Rs. 50,000): Filer – 0.3%, Non-filer – 0.6%. Rs. 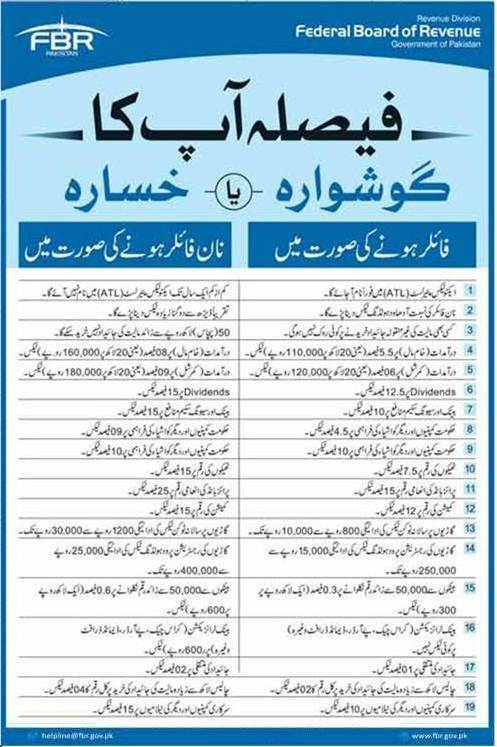 300 per lac for filers and Rs. 600 per lac for non-filers. No taxes for filers on bank transactions (Cross cheque, pay order, demand draft etc.). If you have a business, less withholding taxes will be deducted on your invoices as compared to non-filers. Tax saving on dividends and prizes. You will save on registration and transfer of vehicles. WHT on registration of vehicle is 15,000 to 2,50,000 for filers while 25,000 to 4,00,000 for non filers. You will save on vehicle token tax as compared to non-filers. Token tax for filers is between 800 and 10,000. While token tax for non-filers is between 1200 and 30,000. You will save taxes when buying/ selling or transfer of Property. Preferences in Govt. tenders and saving in taxes. 7.5 percent tax for filers and 15 percent tax for non-filers. For imports of raw material, 5.5 percent for filers while 8 percent for non filers. Its mean on an import of Pak rupees 20,00,000, a filer will pay Rs. 110,000 while a non filer will have to pay Rs. 160,000 as tax. For imports of commercial material tax for filers is 6 percent and 9 percent for non-filers. Tax deducted at source by Banks will be lesser if you file the return otherwise it will mount up. Accurate income assessment while visa and immigration processing. Saving from penalty for non filing of tax return. You will save minimum PKR 20,000/ which you could be liable if you don’t file tax returns. Most of the salaried persons also don’t know about the benefits of becoming an active taxpayer so they are not filing income tax returns. However they are already paying income tax as tax of salaried persons in Pakistan is deducted at source by their respective employers. But if they don’t file income tax returns, it makes them non-filers (even tax is being deducted from their salaries) and they end up paying excessive taxes. Salaried persons can enjoy many benefits just by filing income tax returns as they are already paying their taxes. It is mandatory for all salaried persons to fill their income tax returns; whether they are government or private employees.